Founded by Kevin Pearson & Francis Salmon, Kevin Francis ceramics has become known for its exceptionally high quality and creativity in figural art pottery. Initially focusing on Toby Jugs with designs created and inspired by the partners, the company quickly established itself amongst collectors. entered into an exclusive partnership with Peggy and Rhodri Davies to produce all their designs through their facility, Peggy Davies Ceramics. 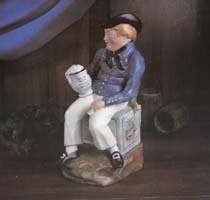 Despite being launched during a recession, the small company survived and by the early 90’s, it was focusing on the British Pottery heritage with its Toby Jug collection. This Collection was a real test for the production artistry of Peggy Davies Ceramics and the results were superb. Also during the 1990’s, the company started to develop their first figurines, building around the theme of Art Deco and the works of Clarice Cliff and Susie Cooper in particular. 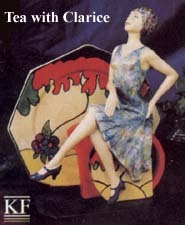 In 1995, Rhodri Davies – now the owner of the UK part of Kevin Francis – introduced the pottery Ladies as a figure with a plate as a backdrop. In true Kevin Francis style, the plates were as intricate and complicated as the figures. These very successful art ware/ figures releases which have gone on to become the backbone of the Kevin Francis collection have been extremely successful. Many of the editions sell out very quickly and certain pieces are already very collectable. The very popular Clarice Cliff Toby Jug is selling for £500 on the secondary market and Tea with Clarice figurine nearly £300. NOTICE – This site is not affiliated with Kevin Francis Ceramics TM. The purpose of these pages is to provide information to collectors of Kevin Francis Ceramics.